According to a 2014 study by Harvard business professors ‘instrumental networking’ (making connections to advance your career) “makes people feel dirty to the point of wanting to take a shower”, AKA very awkward. If you are reading this article, then you like millions of others hate networking, but also recognise it is a necessity of the legal profession. Fortunately for you this article outlines how to network for the person who literally can’t stand networking. The best place to practise your new networking skills is at huge events like our Training Contract and Vacation Scheme Conference, where you will have the opportunity to meet top law firms – for just £5! This tip is identified in the Harvard research study, where it was found that spontaneous networking, say talking to a stranger about a shared interest rather than with the intent to further one’s career, felt 65% less intimidating and awkward. The lesson? When you approach someone new for the first time, do not see them as someone you can use, but as someone you can talk to. If you like what they say, then befriend them; if not, move on. This tip comes from a top international barrister I know that has been a director of leading human rights agencies, Rupert Skilbeck. He would remind us that wherever you go do the research, develop a strategy and have some tactics for networking. These ten tips are tactics, and an overarching strategy might revolve around a main aim for the event, for example, to learn something new. After all, easy plans are easily prepared and easily achieved. This is a follow-up from tip 2, and is a line legal recruiters often say, and it’s basically what gives you an edge in networking and a reason to be interesting to those you talk to. This one is easy to achieve – just research the firms attending a networking event, find out as much relevant information on the company, people and environment concerning those you wish to network with as possible and then it should be easier to network with them when the time comes. This is the advice I received from a communications expert, Karen Christensen, although you will likely have heard it elsewhere. To be a good networker, it is a good idea to be an active listener, that is to say someone who listens to others and responds to what they say. In practice, doing this has the additional benefit of making the conversation more engaging and thus less awkward. Hopefully you know I am referring to alcoholic beverages rather than ketchup. I can see the temptation: you are at a chamber, law firm, university, networking event and you are directed to the foyer where the staff pop a bottle of bubbly. You are invited to partake in the festivities, but if you are anything like me, you will have noticed that few handle their drinks well. While lawyers have a constitution and reputation for drinking, the same cannot be said for someone aiming to impress. Bottom line: to avoid disappointment, stay sober. You approach those in small or none existent groups. 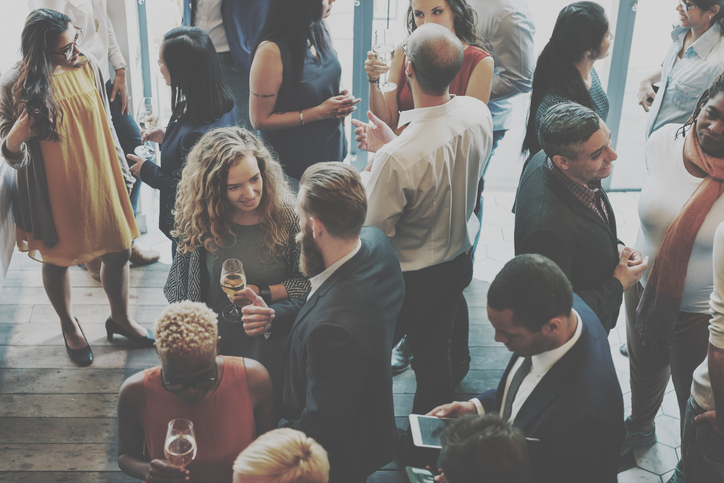 There are a few reasons for this which are good for someone who hates networking: first, it is far less intimidating to approach someone on their own when compared to a group. Second, it will make you feel more confident and appear more confident. I know what you’re thinking: networking is a practical skill, it’s developed in conversation, some people are talented I am not etc. The reality is that every trained networker is someone who took the time to learn from others, be it watching videos, listening to audio or reading up on networking. It is an art which grows from knowledge. This tip comes by the generosity of Forbes writer Amy Morin and has also been written about by a number of others, including Kathy Caprino in her article on toxic behaviours that turn people off. Basically, it’s the idea that unless you know about yourself, your brand, what you can offer, you will be unable to sell the concept to others. This is my own advice and a spin on the classic ‘just be you’ rhetoric that is often said. This tip is about projecting confidence; if you feel at ease then so those you network with will to and, if the inverse is true, then the reverse happens. Follow these tips and, despite hating networking, you may find you learn to love it.